The Richards C5 Series Anemometer is the finest, industrial strength 3-cup style anemometer on the market today. Our Engineers designed the C5 from the ground up. The primary goals were quality as well as durability. During the construction of the sensor, no shortcuts were taken and no compromises were made. C5 Anemometers are produced using the highest grade of raw materials and components available. We also use state-of-the-art machining techniques. All Richards C5 Series Anemometers come standard with our quick disconnect sensor mounting system. The quick connect fitting allows the technician to remove the wind sensor in seconds. All C5 components are made from either corrosion resistant stainless steel or high grade Titanium. We CNC machine the C5 housing, base, and tower from solid 316 Stainless Steel bar stock. We use 316 Stainless Steel for its superior corrosion resistance, precision, performance, and strength. The C5 anemometer utilizes specially designed rotor cups, arms, and hardware. All of these parts are also fabricated from 316 Stainless Steel. In addition we, CNC machine the rotor hub from solid light weight Titanium. We further skeletonize the Hub to remove all unnecessary mass. This process gives the sensor maximum strength and the lowest starting threshold possible. The C5 Anemometer also has a hardened stainless steel shaft. The shaft rotates on two of our specially designed double shielded stainless steel ball bearings. These bearings are also stainless steel. The C5 Anemometer houses unique electronics which have a dual output construction. This means the C5 can produce an AC sine wave or pulse signal output for maximum versatility in the field. 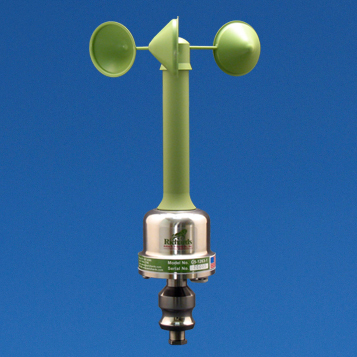 All Richards anemometers have our special green anti-stick coating. This coating helps to prevent dirt and snow build up on the external working parts of the sensor. Another unique feature of the C5 Anemometer is our housing vent system. This system protects the internal electronics from damage due to moisture, dust, and sea salt spray. Stainless Steel Bearings and Shaft. Titanium Rotor together with Stainless Steel Cups.